More info soon! 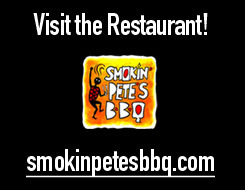 I'll be joining two amazing folks for a four-hour class at Smokin' Pete's BBQ. Tune in to KUOW, NPR Seattle on Monday, July 2 at 9:30am. I'll be talking with host Steve Scher about all things barbecue for the 4th of July. We'll be answer questions for callers too! Can't wait to be back on Bruce "Mr. Barbecue" Bjorkman's radio show, "Cooking Outdoors with Mr. Barbecue". Show is live at 2pm. I'll be on at 2:30pm. The fun continues at MIM with the Pork Smackdown Grill competition. I'll go head to head with Larry "Moinkball" Gaian and Mike "Pit Boss" Hedrick on the Char-Broil stage. Wish me luck! 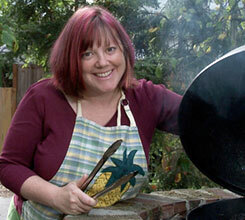 I'll be a guest chef for Char-Broil for one of the most exciting barbecue events of the year. We'll interview teams, demo infrared grills, and host a Celebrity Grilling Competition. Come eat barbecue and buy a copy of She-Smoke. The Alabama Booksmith is in the heart of Birmingham. Event starts at 2pm. Live cooking segment on Birmingham's Good Day Alabama (Fox 6, WBRC) at 7:45am. I'll be joining host Tracye Hutchins on the Better Mornings Atlanta Show (cbs atl). Show runs 5am-7am. Come learn all about the art of smoking ribs low and slow. March 10, 6:30-8:30 at the Pacific Culinary Studio in Everett. Cost is only $45. For more information call (425)353-6468. November 09, 2009 — Turkey Class! July 14, 2009 — Live on AM Northwest! Listen to KXL at 2:30pm - We will announce the contest winners! 6pm web radio interview. Go to www.bbq-4-u.com to hear the show! Cooking Outdoors with Mr. Barbecue. Time 2:30. Book Launch at Smokin' Pete's BBQ, co-hosted by Secret Garden Books. Starting at 6:30pm, Julie will read a little from the book, sign books and celebrate with you. Light barbecue appetizers and refreshments will be served. By RSVP only. Please e-mail julierbq@q.com. Check out her blog: www.eatallaboutit.com to read the interview!